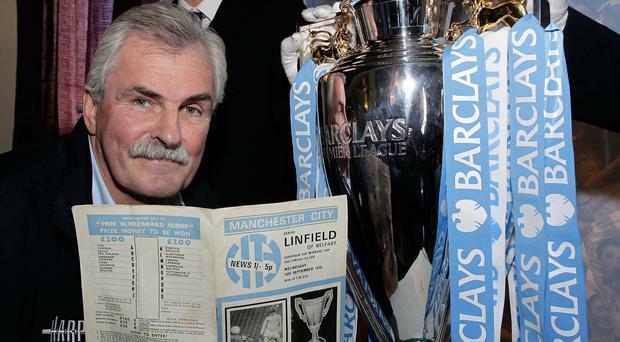 A 17-year-old Alan Fraser almost helped Linfield humble Manchester City in the European Cup. The programme from the second leg. Manchester City's Colin Bell scores the winner to beat Linfield in the first leg at Maine Road. City goalkeeper Joe Corrigan manages to turn Des Cathcart's shot round the post at Windsor Park. Back in 1970 the English giants were holders of the Cup Winners' Cup when they were drawn against the Blues in the first round as they set out to retain the trophy. City were expected to make short work of their neighbours from across the Irish Sea, but Billy Bingham's gallant side were to come within a whisker of pulling off what would have been the greatest result in Irish club football history. City had stumbled to a 1-0 victory at Maine Road courtesy of a Colin Bell goal before crashing to a 2-1 defeat in the second leg as Linfield delivered what their full-back that day Alan Fraser says is still 'Linfield's best ever in Europe'. Blues striker Billy Millen scored after three minutes only for Francis Lee to level with a 20-yard shot that bounced up off the bumpy pitch and over the diving Derek Humphreys, who lost his life in a car crash on his way to another European tie a year later. Millen put the south Belfast club in the lead just after the break with a free-kick, but despite the hosts throwing everything at their illustrious opponents, Ivan McAllister hitting the bar late on, they couldn't secure a crucial third goal and so went out on the 'away goals' rule. Legendary City keeper Joe Corrigan played in both Linfield games nearly half-a-century ago and remembers them as though it were yesterday. The Windsor Park clash was played with the worrying backdrop of the start of the Troubles and kicked off at 5pm. Sadly, some of the anger from the stands spilled over into the occasion itself. "I have two abiding memories of the game in Belfast," Corrigan tells Sunday Life. "Firstly, Linfield should have gone through and, secondly, the sight of Billy Bingham walking behind the goal to plead with home fans to calm down or risk the game being abandoned. "Glass bottles rained down on my goal and I had to stand outside the penalty box to avoid being hit. Later I realised that if I stood inside the goal then the net also protected me." Indeed, although Corrigan plays down the significance there is little doubt he was distracted by a thrown bottle that accounted for a wayward clearance that led to Linfield's winner on the night. He added: "The referee saw what was going on and the game was held up. Billy Bingham knew we were not in our best mindset and they could pull off a shock win. "There was a real threat of the game being stopped and it wasn't helping Linfield's cause. Billy got out of his dug-out and confronted the troublemakers. I can still hear him shouting: 'Please Stop'." The intervention did enough to allow the game to restart in front of an estimated 35,000 capacity crowd and City survived to progress to the second round. "We were taken back to our hotel and told not to venture out," he added. "But a couple of the press corps had gone into Belfast and saw rioting and barricades. They asked the taxi driver to turn round and take them back to the hotel. "On the coach back to the airport we had an armoured car in front and one behind, just like we did for England matches in Belfast. There were people on the coach that we didn't recognise, though we suspected they were SAS officers. One sat at the front and one at the back." Asked if the events off the pitch had much bearing on the result, the 70-year-old, who played over 600 games for City between 1967 and 1983, believes that the holders were well beaten on the night and there could be no real excuses. "We won the first leg 1-0 at Maine Road and didn't really learn from that game," Corrigan continued. "Everybody thought it was going to be a walkover. "We went over to Northern Ireland and I don't think we realised as a team the situation we were in. A bit of complacency set in and again we didn't perform as we should have done. "Linfield were magnificent on both occasions. They ended up getting what they deserved - a win in Belfast and could easily have won the tie." Playing a crucial role for Linfield in both legs of the tie was a 17-year-old Alan Fraser. "I'll never forget the crowd of Bluemen that made the journey over to Maine Road for the first game - they were in their thousands," he recalls. "When the draw came out, our manager Billy Bingham had us training five nights a week. He had it drummed into us that we were going to beat Manchester City. "His motivational skills were unbelievable. We had a good side and we were fit and pumped up for the game. City had all their big hitters on show - Colin Bell, Mike Summerbee, Francis Lee, Alan Oakes and Glynn Pardoe. "I remember reading the local newspaper in Manchester the night before the game. Neil Young stated that if he didn't score a hat-trick against the Irish League part-timers, he would class himself as a failure. "We held them until about 10 minutes from the end. Isaac Andrews had been marking Colin Bell, but he had to go off injured - he was split open. We lost a little bit of shape and Bell scored the winner." For the record, the Linfield team was: Humphreys, Fraser, Patterson, Andrews, McAllister, Bowyer, Millen, Magee, Hamilton, Sinclair, Cathcart. By Graham Luney Josh Robinson is reflecting on a special few days in his life after becoming a father for the first time and then helping his Linfield side become the daddies of the Irish League again.